Plywood flooring is not generally a first choice for people's homes. Sometimes, however, it's necessary to live with it while you await a more permanent solution. There is no need to leave them in their current condition, though. Paint the plywood to get an inexpensive, good looking finished floor in any room of the home. Plywood was not designed to be used as a finished surface covering. It can be made to look and act like one, however, with just a little time and effort. Before you can begin painting, check the floor's condition carefully. Look for water damage and repair as necessary. Notice any damages in the wood itself and determine if repairs are needed. For example, fill any nail holes from the application of other flooring. Sand down any rough edges and remove old paint as much as possible. The floor should also be thoroughly dry when applying paint to it. Painting plywood floors is possible even if they have gone through years of use and some damage. 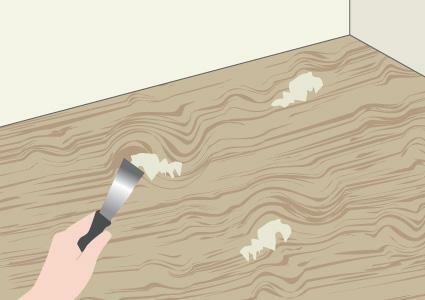 Ensure the plywood is smooth, clean and dry to allow the paint to adhere. Sand down the floor if there is any existing finish or varnish on the floor using a belt sander. Sweep the floor well to remove any dust. Fill any cracks or voids in the plywood with wood filler. Layer the filler in with a putty knife, then scrape the edge of the knife over the fill to blend it flush with the surrounding floor. Allow the filler to dry thoroughly. Lightly sand the patch down once it is dry to ensure a smooth floor. Apply a coat of floor primer to the plywood. Primers work well to hide the wood grain and provide a smooth surface for the paint. 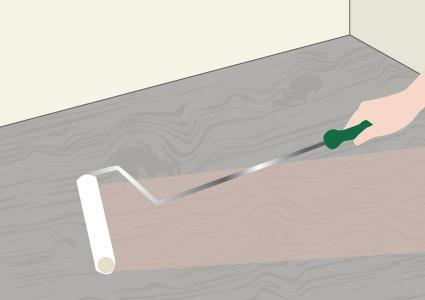 Roll the primer onto the floor using a paint roller with a high-nap on a long handle. Overlap your strokes slightly for good, even coverage, painting yourself backward out of the room. Allow the primer to dry completely until the plywood is no longer tacky. Apply a minimum of two coats of oil or urethane-based floor paint to the plywood. Roll each coat on with a long-handled paint roller. Allow a thorough drying in between each coat. Let the final coat cure for 24 hours. Seal the floor with a minimum of three coats of urethane-based floor sealer. The paint itself is not thick or hard enough to protect the floors from damage due to standard foot traffic. The urethane will give your floor a hard, rigid coat of protection. Urethane sealers come in matte and glossy finishes; choose either one for your floor. Maintain the floor by sweeping and damp mopping regularly. Once a year, apply a new coat of urethane-based sealer to help protect the paint. Add borders to the floor, using a stencil to create a unique look, or add several colors to work as an accent. Create a checkerboard-style alternating squares of two different colors. Use painter's tape to create stripes on the floor, painting the plywood a solid base color first, then taping off sections and apply a second color as a decorative stripe. Give the floor the look of marble or stone tiles by painting it a solid color, taping off the grout joints, then using a sponge roller with cut outs to apply a marbleized effect. Go back in when the paint is dry to hand paint veins. Remove the tape to display the grout lines. Whether your flooring will be plywood for a short time or a longer one, give it a completely new look with a fresh coat of paint. When you're done, no one will be able to tell what it is they are walking on.